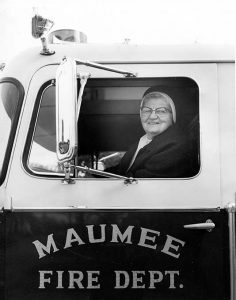 April 27, 2017, Adrian, Michigan – History fans in Michigan are now familiar with Sister Ann Joachim Joachim, OP (1901-1981), a particularly colorful and prominent Adrian Dominican Sister, thanks to an article written by an Adrian Dominican Associate. Arlene Bachanov’s article, “‘Sister Cannonball’: The Nun Who Shook Up Adrian,” was published in the May/June issue of Michigan History. The article details the amazing life of Sister Ann Joachim before and after she entered the Congregation and her influence on society. “She led such a colorful life,” Arlene said of Sister Ann Joachim in an interview. She was a pilot; a boxer; a lawyer who waged a two-year court battle to keep the Wabash Cannon Ball train running (which earned her the moniker “Sister Cannonball”); the first woman attorney to be admitted to practice before the U.S. Supreme Court; and a one-term Commissioner for the City of Adrian. Because of her involvement, Sister Ann Joachim was “very important to the history of southeastern Michigan,” Arlene said. Arlene first encountered Sister Ann Joachim while writing archival profiles of a number of Adrian Dominican Sisters. Sister Nadine Foley, OP, Congregation Historian, had suggested that she write about Sister Ann Joachim. Arlene had wanted to write about Sister Ann Joachim for a long time after first encountering her. She submitted a proposal to the Historical Society of Michigan in August 2016 and later that month received a request for a manuscript for the Society’s approval. She submitted the manuscript on October 25 and received the approval the next day. Arlene conducted her research in the Congregation’s archives, the Siena Heights University archives, and at the Lenawee County Historical Society, the Bentley Historical Library at the University of Michigan in Ann Arbor, the State Library of Michigan, and state archives. In addition, she received help from the reference librarian at Michigan State University. Sister Ann Joachim had been a socialite before she entered the Adrian Dominicans, Arlene noted. She knew a number of prominent people, including Michigan Governors Frank Murphy (1937-1939), one of her law professors, and G. Mennen “Soapy” Williams (1949-1951), as well as Detroit Mayor Jerome Cavanagh (1962-1970). The current issue of Michigan History can be found at Meijer and Barnes & Noble stores in addition to a variety of Michigan bookstores. To order online, click here.